These paper snowflakes (photo above) appear very complex and I was most impressed when the 7 and 8 year-olds at school had made them. 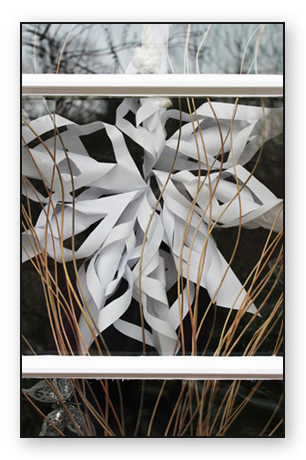 But actually one creates eight simple petals using a square of paper per petal and then staples them together to create a very beautiful paper snowflake which can be the centrepiece of a window. I have also used these as a ‘party game’ with adults where each person makes one section and then we join them all together. Go to this link for step by step instructions and photos on how to make your own winter wonderland snowflakes. 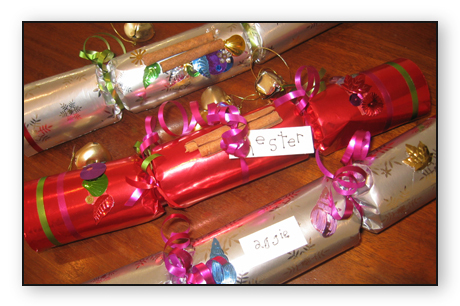 The beauty of homemade crackers is that you can personalise the gift but they are quite fiddly and best made by an older child from about the age of eight or nine. Fillers: a small gift, a balloon, a chocolate, a quotation or forfeit, a streamer or sparkler. Top tip: Take a loo roll inner when shopping to ensure the gifts fit inside! Put the cracker fillers into the loo roll inner and wrap it tightly with tissue paper. Attach the firecracker to the outside of the roll with tape. Position the two loo roll inners on either end of the filled one and thread the firecracker through the inners. Decorate the gift wrap by gluing narrow ribbon on the short ends. Position the gift wrap upside down and place glue or double-sided tape along the long edge of the gift wrap. Place the three loo roll inners along the end of the gift wrap and roll them up in it towards the glued side of the gift wrap. Ensure you roll in a straight line and ensure the paper is firmly wrapped around the loo roll inners. Gently ease out the two end loo roll inners a little and tie a ribbon between them as in the diagrams below. Give the cracker a little twist to make the edges between the loo roll inners crisp. The two end roll inners can now be removed but are useful to keep in place to retain the cracker’s shape if it is to be stored for a period of time. Label the cracker with the recipient’s name and decorate with sequins, tinsel or tulle as desired. Fold a red napkin as in the diagram below. 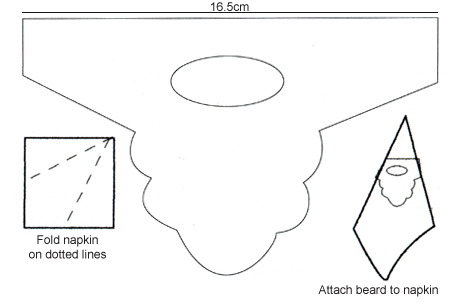 Using the template below scale and trace the bearded shape onto white paper and cut it out. The long edge of the beard should be about 16.5cm long. Fold the paper around the napkin to make a festive Father Christmas! Find a jam jar and a little character to go inside your jar. Stick the character to the lid of the jar and allow it to dry completely. It is best to use a glue gun but you can also use a generous quantity of UHU glue. Place into the jam jar 2 teaspoons of glycerin, ½ teaspoon of washing up liquid and 3 teaspoons of glitter. Glycerin is not essential but helps the glitter not to form clumps. Fill the jar right up to the top with water over a basin or the sink. Screw the lid on very tightly and if you wish, seal around the top with a clear silicone sealant. Placing glue in the rim of the lid before screwing it on also helps to keep it secure. Father Christmas can be reached by care of the Royal Mail and below is his address. He even writes back! This post is part of a Christmas theme of how I as a mum approach this season. As with anything, pick and choose the ideas that appeal to you – I don’t do all of them every year! However I have included all the activities, crafts and traditions that I have done over the past few years. Feel free to share your ideas as comments. Thanks Megan for this comment and link: Here’s the paper baubles link: http://www.guardian.co.uk/lifeandstyle/2012/dec/03/how-to-make-paper-christmas-baubles. Looks right up your street!